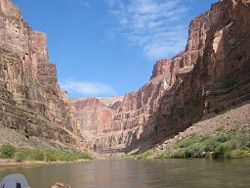 The Grand Canyon, as seen from river-level. The Grand Canyon is a very colorful, steep-sided gorge, carved by the Colorado River, in the U.S. state of Arizona. It is contained largely within the Grand Canyon National Park, one of the first national parks in the United States. The canyon is about 277 miles (445 km) long, up to a mile (1.6km) deep, and from 0.25 - 15 miles (.4 - 24 km) wide. Geologists estimate that formation of the canyon required at least 2 billion years considering that the layers exposed on the canyon walls and floor represent roughly two billion years of Earth history. Building up those hundreds of sedimentary layers required roughly 1.8 billion years, and 200 million years more were required for uplift and climate change to drain the seas then elevate them as the Colorado Plateau while the Colorado River simultaneously cut its channel. Most of the actual carving out of the canyon is thought to have occurred over the "brief" span of time between 2 and 1 million years ago. Grand Canyon from the South Rim, 2006. Grand Canyon seen from the South Rim, 2003. Grand Canyon from the Kaibab Trail. Looking down Bright Angel trail to the Grand Canyon. The green area is Indian Gardens and the trail continues to Phantom Ranch at the river where a suspension bridge allows access to the North Rim. The canyon appears on many versions of the Seven Natural Wonders of the World list and is one of the world's most popular tourist destinations. President Theodore Roosevelt, a major proponent of the Grand Canyon area, visited on numerous occasions to hunt mountain lions and enjoy the scenery. The Grand Canyon is a deep cut in the Colorado Plateau that exposes uplifted Proterozoic and Paleozoic strata. The exposed strata are gradually revealed by the gentle incline beginning in the east at Lee's Ferry and continuing to Hance Rapid in the west. At the point where the Colorado River crosses the Grand Wash Fault (near Lake Mead), the Canyon ends. Sedimentary layers exposed in the canyon walls range in age roughly from 200 million to 2 billion years and were formed primarily in warm shallow seas. Uplift associated with plate tectonics-caused mountain building events later moved these sediments thousands of feet upward and created the Colorado Plateau. The higher elevation has also resulted in greater precipitation in the Colorado River drainage area, but not enough to change the Grand Canyon area from being semi-arid. Landslides and other mass wasting events then caused head-ward erosion and stream capture—all of which tend to increase the depth and width of canyons in arid environments. 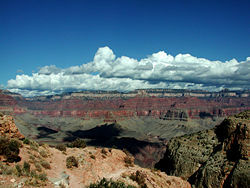 The uplift of the Colorado Plateau is uneven, resulting in the North Rim of the Grand Canyon being over a thousand feet higher than the South Rim. The fact that the Colorado River flows closer to the South Rim is also explained by this asymmetrical uplift. Almost all runoff from the plateau behind the North Rim (which also gets more rain and snow) flows toward the Grand Canyon, while much of the runoff on the plateau behind the South Rim flows away from the canyon (following the general tilt). The result is much greater erosion and thus faster widening of the canyon and its tributary canyons north of the Colorado River. Temperatures on the North Rim are generally lower than the South Rim because of the greater elevation (8000 feet above sea level). Heavy snowfall is common during the winter months. Views from the North Rim tend to give a better impression of the expanse of the canyon than those from the South Rim. 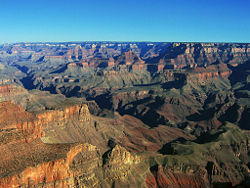 The principal consensus among geologists is that the Colorado River basin (of which the Grand Canyon is a part) has developed in the past 40 million years and that the Grand Canyon itself is probably less than five to six million years old (with most of the down-cutting occurring in the last two million years). The result of all this erosion is one of the most complete geologic columns on the planet. 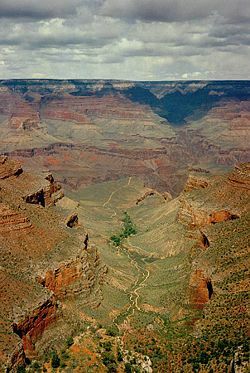 The major geologic exposures in Grand Canyon range in age from the two-billion-year-old Vishnu Schist at the bottom of the Inner Gorge to the 230-million-year-old Kaibab Limestone on the Rim. Many of the formations were deposited in warm shallow seas, near-shore environments (such as beaches), and swamps as the seashore repeatedly advanced and retreated over the edge of a proto-North America. Major exceptions include the Permian Coconino Sandstone which was laid down as sand dunes in a desert and several parts of the Supai Group. The great depth of the Grand Canyon and especially the height of its strata (most of which formed below sea level) can be attributed to 5,000 to 10,000 feet of uplift of the Colorado Plateaus, starting about 65 million years ago (during the Laramide Orogeny). This uplift has steepened the stream gradient of the Colorado River and its tributaries, which in turn has increased their speed and thus their ability to cut through rock (see the elevation summary of the Colorado River for present conditions). About one million years ago, volcanic activity (mostly near the western canyon area) deposited ash and lava over the area, which at times completely obstructed the river. These volcanic rocks are the youngest in the canyon. Map of Grand Canyon area. 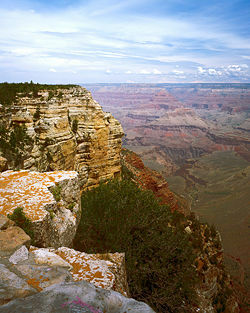 In September 1540, under orders from the conquistador Francisco Vasquez de Coronado to search for the fabled Seven Cities of Cibola, Captain Garcia Lopez de Cardenas, along with Hopi guides and a small group of Spanish soldiers, traveled to the South Rim of the Grand Canyon between Desert View and Moran Point. Pablo de Melgrossa, Juan Galeras, and a third soldier descended some one-third of the way into the canyon until they were forced to return because of lack of water. It is speculated that their Hopi guides must have been reluctant to lead them to the river, since they must have known routes to the canyon floor. Afterwards, no Europeans visited the canyon for over two hundred years until the search of a route from Santa Fe to California in 1776. The area was first inhabited by Native Americans who built settlements within the canyon walls. Among these, the earliest group identified to date have been classified as basketmakers and called the Anasazi tribe, which has been dated at about 500 B.C.E. Their successors in the canyon have been called the Pueblo people who are considered to be ancestors of the Hopi people. The Oraibi have occupied one of their dwelling sites, since 1150. The Cohonina also lived in the area. Large numbers of dated archaeological sites indicate that the Anasazi and the Cohonina flourished until about 1200 C.E. Something happened a hundred years after that, however, and common thought is that a drought forced inhabitants of both of these cultures to move away. The Hopi people believe even today, that they emerged from the canyon and that their spirits rest there. The Paiute, Cerbat, and Navajo tribes also inhabited the area at different times. The Havasupai and Hualapai are descended from the Cerbat and still live in the immediate area. The Havasupai currently maintain 188,077 acres within the Canyon and rely on farming, grazing and tourism for their livelihood. Surrounded by cliffs, some portions of their reservation is only accessible by a narrow trail. James Ohio Pattie, along with a group of European American trappers and mountain men, was probably the next European to reach the Grand Canyon in 1826, although there is little documentation to support this. Jacob Hamblin (a Mormon missionary) was sent by Brigham Young in the 1850s to locate easy river crossing sites in the Canyon. Building good relations with local Native Americans and white settlers, he discovered Lee's Ferry in 1858 and Pierce Ferry (later operated by, and named for, Harrison Pierce)—the only two sites suitable for ferry operation. In 1857, the U.S. War Department asked Lieutenant Joseph Ives to lead an expedition to assess the feasibility of an up-river navigation from the Gulf of California. Also in a stern wheeler steamboat "Explorer," after two months and 350 miles of difficult navigation, his party reached Black Canyon some two months after George Johnson. The "Explorer" struck a rock and was abandoned. Ives led his party east into the Canyon; they were the first European Americans to travel the Diamond Creek drainage and traveled eastwards along the South Rim. The first scientific expedition to the canyon was led by U.S. Major John Wesley Powell in the late 1860s. Powell referred to the sedimentary rock units exposed in the canyon as "leaves in a great story book." There are several historical buildings located along the South Rim; most are in Grand Canyon Village. The El Tovar Hotel, built in 1905, is the most luxurious of all lodging located in the South Rim. The hotel consists of four stories with a rustic and Swiss chalet look. It was designed by Charles Whittlesey. A gift shop and restaurant are located inside the hotel. Bright Angel Lodge, built in 1935, consisted of logs and stone. American architect Mary Colter designed the lodge, which was built by Fred Harvey. Inside the lodge is a small museum honoring Fred Harvey who played a major role in popularizing the Grand Canyon. In the history room is a fireplace made of stone from the South Rim and layered in the same sequence as the canyon. Buckey O'Neill Cabin was built during the 1890s by William Owen O'Neill. He built the cabin because of a copper deposit that was nearby. He had several occupations such as miner, judge, politician, author and tour guide. This cabin is the longest continually standing structure on the South Rim. It is currently used as a guest house and booking is required well in advance. Hopi House was built by the Hopi in 1905. It is based on structures that were built in an ancient Hopi settlement called Old Oraibi, located on the Third Mesa in eastern Arizona. It served as a residence for the Hopi Indians who sold arts and crafts to visitors in the South Rim. Verkamp's Curios was built by John Verkamp in 1905. He sold arts and crafts as well as souvenirs. It is currently run by his descendants and stands next to the Hopi House. Kolb Studio was built in 1904 by brothers Ellsworth and Emery Kolb. They were photographers who made a living by photographing visitors walking down the Bright Angel Trail. In 1911, the Kolb brothers filmed their journey down the Green and Colorado Rivers. This video was constantly shown to visitors by Emery until 1976, when he died at the age of 95. Grand Canyon Depot, built in 1909, is a two level building and the only remaining structural log railroad depot in the United States. The depot is the northern terminus of the Grand Canyon Railway which begins in Williams, Arizona. Lookout Studio, built in 1914, is another structure that was designed by Mary Colter. Photography artwork, books, souvenirs and rock and fossil specimens are sold here. A great view of Bright Angel Trail can be seen here. Desert View Watchtower, built in 1932, is one of Mary Colter's best-known works. 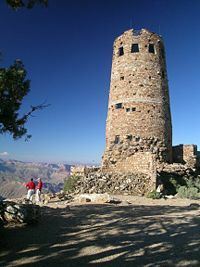 Situated at the far-eastern end of the South Rim many miles from Grand Canyon Village, the tower sits on a promontory and offers one of the few views of the bottom of the Canyon and the Colorado River. Designed to mimic an Anasazi watchtower, in actual size it is larger than any known Anasazi tower. On June 30, 1956, United Airlines Flight 718 and TWA Flight 2 collided in mid-air over the Grand Canyon. The wreckage of both planes fell into the eastern portion of the canyon near the confluence of the Colorado and Little Colorado rivers. This incident led to the institution of high-altitude flight ways and positive control by en route ground controllers. The Grand Canyon has suffered some problems with air pollution, attributed to nearby coal-burning power plants. In 1991 an agreement was reached with the Navajo Generating Station in Page, Arizona to add air pollution control devices to their smokestacks. In the same year the EPA launched an investigation of the Mohave Generating Station in Laughlin, Nevada. Aside from casual sightseeing from the South Rim (averaging 7000 feet above sea level), whitewater rafting, hiking and running are especially popular. The floor of the valley is accessible by foot, muleback, helicopter, or by boat or raft from upriver. The canyon is extremely popular with endurance athletes, who regularly run across it. A one-way trip (rim-to-rim) takes place in around five to seven hours, or a round-trip (the rim-to-rim-to-rim or "double-cross") in around 11 to 14 hours. Allyn Cureton of Williams, Arizona holds the record for a north to south rim crossing at a staggering three hours and six minutes, set in 1981. In March 2006, Phil Lowry of Springville, UT finished a 56-mile non-corridor route in 18 hours, traveling from Grandview Point to Phantom Ranch via the Tonto Trail, then out and back to Clear Creek and back to the rim via the Bright Angel Trail. In November 2006, Crockett accomplished the first double-cross from North Kaibab to Hermits Rest and back. Grand Canyon National Park is one of the world’s premier natural attractions, attracting about five million visitors per year. Overall, 83 percent were from the United States: California (12.2 percent), Arizona (8.9 percent), Texas (4.8 percent), Florida (3.4 percent) and New York (3.2 percent) represented the top domestic visitors. Seventeen percent of visitors were from outside the United States; the most prominently represented nations were the United Kingdom (3.8 percent), Canada (3.5 percent), Japan (2.1 percent), Germany (1.9 percent) and The Netherlands (1.2 percent). Hiking down to the river and back up to the rim in one day is discouraged by park officials because of the distance, steep and rocky trails, change in elevation, and danger of heat exhaustion from the much higher temperatures at the bottom. 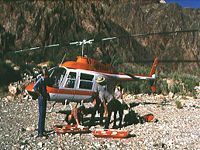 Rescues are required annually of unsuccessful rim-to-river-to-rim travelers. Nevertheless, hundreds of fit and experienced hikers complete the trip every year. Weather is a primary consideration because of late summer monsoons, so accurate forecasts are imperative. While the park service posts weather information at gates and visitor centers, this is a rough approximation only, and should not be relied upon for trip planning. For accurate weather in the Canyon, hikers should consult the National Weather Service's NOAA weather radio or the official NWS website. The National Park Service provides wheelchairs for temporary day use by park visitors for free. About 600 deaths have occurred in the Grand Canyon since the 1870s. Some of these deaths occurred as the result of overly zealous photographic endeavors, some were the result of airplane collisions within the canyon, and some visitors drowned in the Colorado River. Many hikers overestimate their fitness level, become dehydrated and confused, and must be rescued. The Park Service now posts a picture of an attractive and fit young man at several trail heads with the caption "Many of them look like him," in an attempt to discourage hikers from feats which are beyond their abilities. According to Over the Edge: Death in the Grand Canyon, (2001) 50 fatalities have resulted from falls; 65 deaths were attributable to environmental causes, including heat stroke, cardiac arrest, dehydration, and hypothermia; 7 were caught in flash floods; 79 were drowned in the Colorado River; 242 perished in airplane and helicopter crashes (128 of them in the aforementioned 1956 disaster); 25 died in freak errors and accidents, including lightning strikes and rock falls; 47 committed suicide; and 23 were the victims of homicides. Many challenges face the federal government administrators who manage park resources. These include issues related to: the recent reintroduction into the wild of the highly endangered California Condor, air tour overflight noise levels, water rights disputes with various tribal reservations that border the park, and forest fire management. This page was last modified on 5 August 2016, at 16:32.